Do you have a service available in the Nambour area? 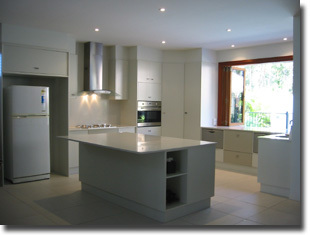 We are a local Sunshine Coast based company. We are currently available to cover the area between Brisbane and Gympie. What would be the approx. cost to clean the tiles & grout for an averaged size house? Prices vary depending on the time it will take, the type of tile, and how dirty the area is. Prices can vary from $200 to around $600. Do you charge per square metre or according to necessary work? Cleaning & sealing is charged on a square metre rate, cleaning on its own may be on a square metre rate or a base charge. Yes. We offer free quotes and a free test clean. What sort of a time factor would be involved for cleaning an averaged sized house with tiles in all rooms except bedrooms? It can take (on average) around four hours for tile cleaning throughout a house. We have two cleaners per job to clean most areas. What sort of a time factor would be involved before normal traffic in the areas could re-commence? If the floors have just been cleaned, they are dry almost immediately. If they have been sealed, we recommend allowing 2 hours drying time. Will the cleaners damage my tiles ? No. We do not use high pressure cleaners as these can damage the grout area. We use scrubbers, buffers, a water vac and detergents to clean your wall and floor tiles. We have over 20 years experience in supplying, laying and cleaning tiles. We can correctly identify your type of tile and use the best products to clean them. We use a scrubber and cleaning solutions to beak down the grease, grime and dirt in your floor. We then use a specialised vacuum to extract & remove the dirt from your tile and grout. The cleaners work deep into the surface of the tile & grout, removing the dirt and grime that other cleaning methods can't. Why should I seal my tiles and grout ? 1. It gives you time to remove the staining product, to help reduce the damage from the stain. 2. Staining can still occur if the staining product is not removed from the tile. 3. Sealing will help to achieve better results when cleaning your tiles. Can you clean coloured grout ? We have had limited success with this grout. We can achieve a result that is about 50% better. If the grout is badly soiled we may recommend re-grouting. Could you use our services in your home?